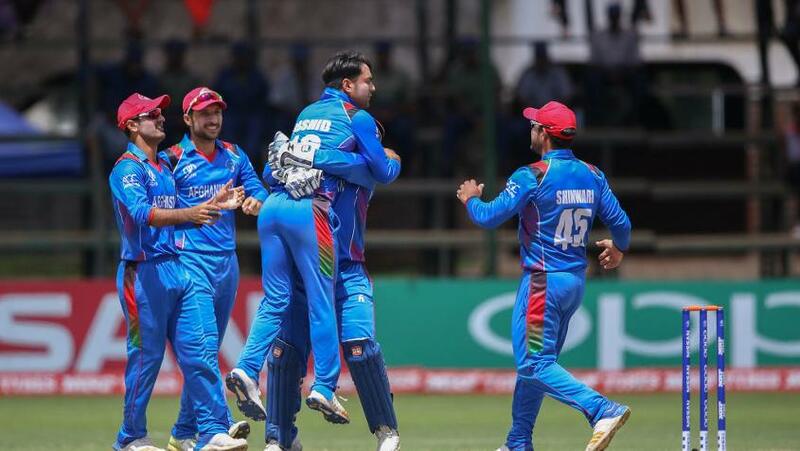 Off-spinner Mujeeb Rahman upstaged Rashid Khan’s world record of fastest to 100 ODI wickets while opener Mohammad Shahzad produced a sparkling half-century as Afghanistan defeated the Windies by seven wickets to win the ICC Cricket World Cup Qualifier 2018 at the Harare Sports Club on Sunday. Mujeeb returned figures of 9.5-0-43-4, including three wickets in four balls of his last over, as the Windies were skittled out for 204 in 46.5 overs after electing to bat first. Shahzad stroked his second successive half-century, while hitting a 93-ball 84 with 11 fours and two sixes to steer his side home with 9.2 overs to spare. 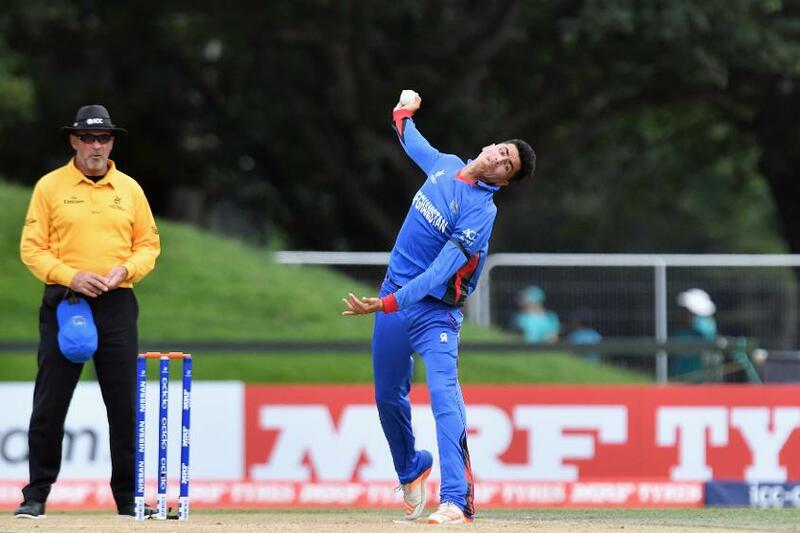 These stellar performances came after 19-year-old Rashid Khan, the world’s number-one ranked ODI bowler, had become the fastest bowler to 100 ODI wickets. He achieved the feat in his 44th ODI when he dismissed Shai Hope to beat Australia’s Mitchell Starc’s record in 52 ODIs. 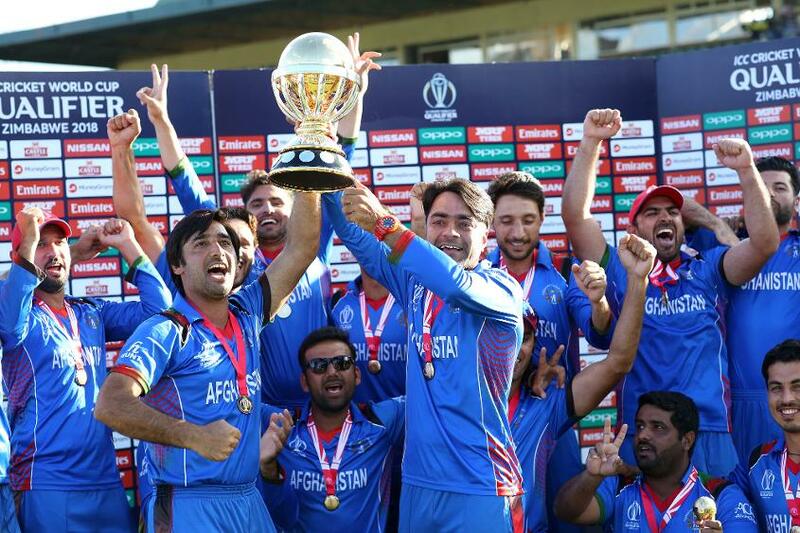 This is Afghanistan’s first major ICC title after they had finished second to Ireland in the 50-over ICC World Cricket League Championship in 2013. The side, which was playing in the ICC World Cricket League Division 5 until 2008, has won the four-day first-class ICC Intercontinental Cup twice (2009-10, 2015-17) and ICC World Twenty20 Qualifier 2010. The victorious Afghanistan team after wining The ICC Cricket World Cup Qualifier Final between The Windies and Afghanistan at The Harare Sports Club on March 25, 2018 in Harare, Zimbabwe. 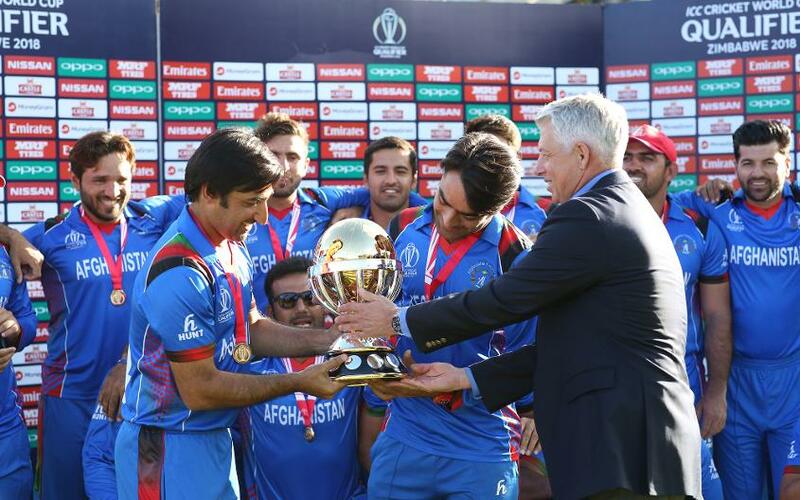 “This trophy is for the people of Afghanistan,” a delighted Afghanistan captain Asghar Stanikzai said, adding: “This is nothing but a miracle that we have won this tournament. This would not have been possible without the prayers, support and well-wishes of all our fans. This title is for them. “This is Afghanistan’s by far the greatest victory. Beating the mighty Windies in the final of a tournament which is no less than a mini-World Cup, is something like a dream come true for all of us. We used to only imagine if we will ever get an opportunity to ever play against them, and now beating them twice in the same tournament is something that sits on the very top of our cricketing history,” Asghar said after Afghanistan went 3-1 ahead in five matches. “The boys have shown what they are capable of. If we have come this far in 10 years, I leave it to you to decide where we can be in the next 10 years. I will not single out any individual, it has been thoroughly a team effort where each and every player backed and supported each other in the very difficult times early in the tournament. “I think it is a victory of self-belief and self-confidence. This victory will give us the required boost to work extremely hard over the next 14 months and like the other nine sides, will arrive in England and Wales firmly believing we can win the World Cup,” an emotional Asghar, who is yet to fully recover from an appendix operation, remarked. Windies captain Jason Holder said: “Well done to Afghanistan, especially the way they played after the group stages. Having said that, I'm proud of my boys. We came here to achieve a target, and various boys put their hands up. We had a quick turnaround between games, but I'm proud of them for sticking in. Obviously disappointed not to win this final but we had some great performances throughout. I want to thank my team for their support." Mujeeb was once again the destroyer in chief of the Windies’ batting. Opening the bowling, he immediately put the Windies on the back foot when he accounted for Chris Gayle, before picking up three wickets in his 10th over to finish with four for 43. Gulbadin Nain snapped up two for 28, while Dawlat Zadran, Sharafuddin Ashraf and Rashid Khan picked up a wicket apiece, but most importantly didn’t allow the Windies batsmen to change gears. After Shahzad’s departure, Gayle also accounted for Rahmat Shah (51, 78b, 4x4) but it was too late as Afghanistan achieved the victory target for the loss of three wickets in 40.4 overs. Seasoned all-rounder Mohammad Nabi finished with a flourish, clobbering Gayle for three consecutive sixes to the cheer of his enthusiastic team-mates.